Let us introduce to you one of the latest developments to embed signage: Advanced User Groups. Advanced User Groups allows users to segment an account into multiple groups with their own roles and permissions. Rules can then be applied to these groups to include or exclude items within embed signage. Keep reading for our step by step guide that will help explain the new features and how you can best make use of them. Why Use Advanced User Groups? This feature allows you to completely segment an account. In doing so, you can improve user workflows and management of the digital signage network. In our example below, we have a fictional company called ‘ABC Inc’. ABC Inc have offices in London and New York. They have one embed signage account but want the London and New York offices to have control over their own digital signage without either location having access to the other. This is setup on every embed signage account by default. Setting up the IT Technician role, we allow access to: View, Register, Edit and Delete devices. Next up, we set up the Creative role that has access to: view, add and edit layouts and playlists as well as viewing, uploading and editing media items. Ensure the ‘user role’ for each user is assigned correctly so that each new user is given the specific permissions assigned to their roles. Got all the users set up? Good. Now let’s start adding them to the relevant groups. We’ve got our user roles defined and our users set up, now we need to segment the users into the relevant groups. Only Show items – with any of the following tags – ‘your tag here’. Users in the group will only see items that have been tagged with any of the specified tags. In our example, the tag ‘London’. Only Show items – with all of the following tags – ‘your tag here’. Users in the group will only see items that have been tagged with all of the specified tags. Exclude items – with any of the following tags – ‘your tag here’. Users in the group will not be able to see any items that have been tagged with any of the specified tags. Exclude items – with all of the following tags – ‘your tag here’. Users in the group will not be able to see any items that have been tagged with all of the specified tags. The next setting we can configure to the group is setting an Upload Limit. This is the amount of account storage allocated to the group. Every embed signage account gets 10GB free storage space and a portion of that can be allocated to a User Group. This allocated amount is sectioned off from the main account storage total to avoid any limit being exceeded. The final setting we need to configure on the group is ‘Shareable’. If ‘yes’ is selected, this means that users in the London group could for example, tag a piece of media with the New York Group tag i.e. ‘New York’ and this item would then be shared with users in the New York group to see. If ‘no’ is selected, users in the group cannot share their items with other groups. Now we’ve set up the user roles, added users and segmented them into groups we need to add items to those groups. We do this using tags. Tags can be added to almost any item within embed signage. 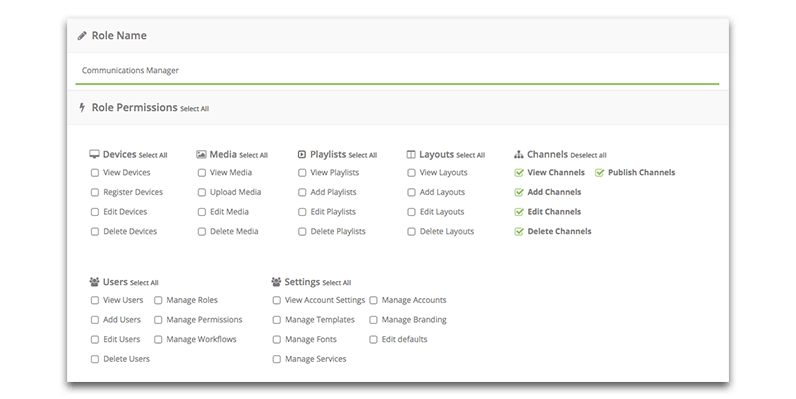 Users can tag folders and all items within folders, individual devices, media, layouts, channels, global playlists, plugins, account settings and various other elements within an account. And that’s it… Now simply repeat the process to configure all the necessary User Groups to segment the account. Now you know how to use Advanced User Groups on an account, we invite you to give it a try today. If you do not yet have an account, sign up for a free 28 day trial to try this and all of our other digital signage software features.